This full-length animated feature film is available to purchase from Nintendo eShop on Nintendo 3DS family systems now. 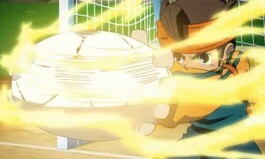 80 years after Raimon Jr. High won the Football Frontier, football has gained a strong popularity. Mark Evans, the club captain, inspired his team to victory with his relentless spirit and style of management, and influenced many people to love football. However, the revolutionaries, led by Seymour Hillman, believe football weakens the minds of children in the future. They think Mark is the cause, so they form the world's strongest team consisting of specially trained soldiers, and call it Team Ogre. They send the team to the Football Frontier 80 years in the past to stop Raimon Jr. High becoming champions, changing the course of history – and the future – in the process. Rating: Suitable for 7 years and over.